Token Exchange is Technology Preview and is not fully supported. This feature is disabled by default. To enable start the server with -Dkeycloak.profile=preview. For more details see Profiles. In Red Hat Single Sign-On, token exchange is the process of using a set of credentials or token to obtain an entirely different token. A client may want to invoke on a less trusted application so it may want to downgrade the current token it has. A client may want to exchange a Red Hat Single Sign-On token for a token stored for a linked social provider account. You may want to trust external tokens minted by other Red Hat Single Sign-On realms or foreign IDPs. A client may have a need to impersonate a user. Here’s a short summary of the current capabilities of Red Hat Single Sign-On around token exchange. A client can exchange an external token for a Red Hat Single Sign-On token. 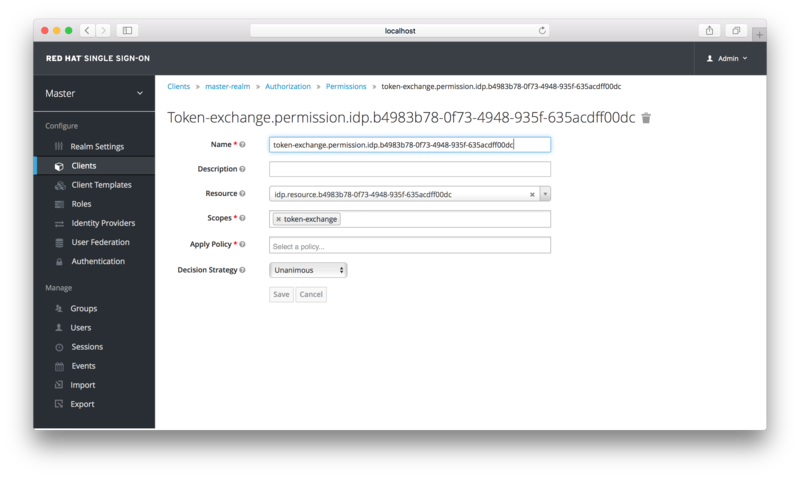 Token exchange in Red Hat Single Sign-On is a very loose implementation of the OAuth Token Exchange specification at the IETF. We have extended it a little, ignored some of it, and loosely interpreted other parts of the specification. It is a simple grant type invocation on a realm’s OpenID Connect token endpoint. REQUIRED MAYBE. This parameter is required for clients using form parameters for authentication. If you are using Basic Auth, a client JWT token, or client cert authentication, then do not specify this parameter. REQUIRED MAYBE. This parameter is required for clients using form parameters for authentication and using a client secret as a credential. Do not specify this parameter if client invocations in your realm are authenticated by a different means. REQUIRED. The value of the parameter must be urn:ietf:params:oauth:grant-type:token-exchange. OPTIONAL. A security token that represents the identity of the party on behalf of whom the request is being made. It is required if you are exchanging an existing token for a new one. OPTIONAL. Identifies the issuer of the subject_token. It can be left blank if the token comes from the current realm or if the issuer can be determined from the subject_token_type. Otherwise it is required to be specified. Valid values are the alias of an Identity Provider configured for your realm. Or an issuer claim identifier configured by a specific Identity Provider. OPTIONAL. This parameter is the type of the token passed with the subject_token parameter. This defaults to urn:ietf:params:oauth:token-type:access_token if the subject_token comes from the realm and is an access token. If it is an external token, this parameter may or may not have to be specified depending on the requirements of the subject_issuer. OPTIONAL. This parameter specifies the target client you want the new token minted for. OPTIONAL. This parameter specifies that the client wants a token minted by an external provider. It must be the alias of an Identity Provider configured within the realm. OPTIONAL. This specifies a username or user id if your client wants to impersonate a different user. NOT IMPLEMENTED. This parameter represents the target set of OAuth and OpenID Connect scopes the client is requesting. It is not implemented at this time but will be once Red Hat Single Sign-On has better support for scopes in general. We currently only support OpenID Connect and OAuth exchanges. Support for SAML based clients and identity providers may be added in the future depending on user demand. A successful response from an exchange invocation will return the HTTP 200 response code with a content type that depends on the requested-token-type and requested_issuer the client asks for. OAuth requested token types will return a JSON document as described in the OAuth Token Exchange specification. Clients requesting a refresh token will get back both an access and refresh token in the response. Clients requesting only access token type will only get an access token in the response. Expiration information may or may not be included for clients requesting an external issuer through the requested_issuer paramater. Additional error claims may be returned depending on the exchange type. For example, OAuth Identity Providers may include an additional account-link-url claim if the user does not have a link to an identity provider. This link can be used for a client initiated link request. Token exchange setup requires knowledge of fine grain admin permissions (See the Server Administration Guide for more information). You will need to grant clients permission to exchange. This is discussed more later in this chapter. The rest of this chapter discusses the setup requirements and provides examples for different exchange scenarios. For simplicity’s sake, let’s call a token minted by the current realm as an internal token and a token minted by an external realm or identity provider as an external token. With an internal token to token exchange you have an existing token minted to a specific client and you want to exchange this token for a new one minted for a different target client. Why would you want to do this? This generally happens when a client has a token minted for itself, and needs to make additional requests to other applications that require different claims and permissions within the access token. Other reasons this type of exchange might be required is if you need to perform a "permission downgrade" where your app needs to invoke on a less trusted app and you don’t want to propagate your current access token. Clients that want to exchange tokens for a different client need to be authorized in the admin console to do so. You’ll need to define a token-exchange fine grain permission in the target client you want permission to exchange to. Toggle the Permissions Enabled switch to true. You should see a token-exchange link on the page. Click that to start defining the permission. It will bring you to this page. You’ll have to define a policy for this permission. Click the Authorization link, go to the Policies tab and create a Client Policy. Here you enter in the starting client, that is the authenticated client that is requesting a token exchange. After you create this policy, go back to the target client’s token-exchange permission and add the client policy you just defined. Your client now has permission to invoke. If you do not do this correctly, you will get a 403 Forbidden response if you try to make an exchange. When your client is exchanging an existing token for a token targeting another client, you must use the audience parameter. This parameter must be the client identifier for the target client that you configured in the admin console. The subject_token parameter must be an access token for the target realm. If your requested_token_type parameter is a refresh token type, then the response will contain both an access token, refresh token, and expiration. Here’s an example JSON response you get back from this call. The user account was linked through the external identity provider using Client Initiated Account Linking API. Finally, the external identity provider must have been configured to store tokens, or, one of the above actions must have been performed with the same user session as the internal token you are exchanging. If the account is not linked, the exchange response will contain a link you can use to establish it. This is discussed more in the Making the Request section. Internal to external token exchange requests will be denied with a 403, Forbidden response until you grant permission for the calling client to exchange tokens with the external identity provider. To grant permission to the client you must go to the identity provider’s configuration page to the Permissions tab. Here you enter in the starting client, that is the authenticated client that is requesting a token exchange. After you create this policy, go back to the identity providers’s token-exchange permission and add the client policy you just defined. When your client is exchanging an existing internal token to an external one, you must provide the requested_issuer parameter. The parameter must be the alias of a configured identity provider. The subject_token parameter must be an access token for the target realm. The requested_token_type parameter must be urn:ietf:params:oauth:token-type:access_token or left blank. No other requested token type is supported at this time. Here’s an example successful JSON response you get back from this call. The error claim will be either token_expired or not_linked. The account-link-url claim is provided so that the client can perform Client Initiated Account Linking. Most (all?) providers are requiring linking through browser OAuth protocol. With the account-link-url just add a redirect_uri query parameter to it and you can forward browsers to perform the link. You can trust and exchange external tokens minted by external identity providers for internal tokens. This can be used to bridge between realms or just to trust tokens from your social provider. It works similarly to an identity provider browser login in that a new user is imported into your realm if it doesn’t exist. The current limitation on external token exchanges is that if the external token maps to an existing user an exchange will not be allowed unless the existing user already has an account link to the external identity provider. When the exchange is complete, a user session will be created within the realm, and you will receive an access and or refresh token depending on the requested_token_type parameter value. You should note that this new user session will remain active until it times out or until you call the logout endpoint of the realm passing this new access token. These types of changes required a configured identity provider in the admin console. SAML identity providers are not supported at this time. Twitter tokens cannot be exchanged either. Before external token exchanges can be done, you must grant permission for the calling client to make the exchange. This permission is granted in the same manner as internal to external permission is granted. If you also provide an audience parameter whose value points to a different client other than the calling one, you must also grant the calling client permission to exchange to the target client specific in the audience parameter. How to do this is discussed earlier in this section. The subject_token_type must either be urn:ietf:params:oauth:token-type:access_token or urn:ietf:params:oauth:token-type:jwt. If the type is urn:ietf:params:oauth:token-type:access_token you must specify the subject_issuer parameter and it must be the alias of the configured identity provider. If the type is urn:ietf:params:oauth:token-type:jwt, the provider will be matched via the issuer claim within the JWT which must be the alias of the provider, or a registered issuer within the providers configuration. For validation, if the token is an access token, the provider’s user info service will be invoked to validate the token. A successful call will mean that the access token is valid. If the subject token is a JWT and if the provider has signature validation enabled, that will be attempted, otherwise, it will default to also invoking on the user info service to validate the token. By default, the internal token minted will use the calling client to determine what’s in the token using the protocol mappers defined for the calling client. Alternatively, you can specify a different target client using the audience parameter. If your requested_token_type parameter is a refresh token type, then the response will contain both an access token, refresh token, and expiration. Here’s an example JSON response you get back from this call. For internal and external token exchanges, the client can request on behalf of a user to impersonate a different user. For example, you may have an admin application that needs to impersonate a user so that a support engineer can debug a problem. The user that the subject token represents must have permission to impersonate other users. See the Server Administration Guide on how to enable this permission. It can be done through a role or through fine grain admin permissions. Make the request as described in other chapters except additionally specify the request_subject parameter. The value of this parameter must be a username or user id. You can make an internal token exchange request without providing a subject_token. This is called a direct naked impersonation because it places a lot of trust in a client as that client can impersonate any user in the realm. You might need this to bridge for applications where it is impossible to obtain a subject token to exchange. For example, you may be integrating a legacy application that performs login directly with LDAP. In that case, the legacy app is able to authenticate users itself, but not able to obtain a token. It is very risky to enable direct naked impersonation for a client. If the client’s credentials are ever stolen, that client can impersonate any user in the system. If the audience parameter is provided, then the calling client must have permission to exchange to the client. How to set this up is discussed earlier in this chapter. Additionally, the calling client must be granted permission to impersonate users. In the admin console, go to the Users screen and click on the Permissions tab. You should see a impersonation link on the page. Click that to start defining the permission. It will bring you to this page. Here you enter in the starting client, that is the authenticated client that is requesting a token exchange. After you create this policy, go back to the users' impersonation permission and add the client policy you just defined. Your client now has permission to impersonate users. If you do not do this correctly, you will get a 403 Forbidden response if you try to make this type of exchange. Public clients are not allowed to do direct naked impersonations. To make the request, simply specify the requested_subject parameter. This must be the username or user id of a valid user. You can also specify an audience parameter if you wish. When granting clients permission to exchange, you don’t necessarily have to manually enable those permissions for each and every client. If the client has a service account associated with it, you can use a role to group permissions together and assign exchange permissions by assigning a role to the client’s service account. For example, you might define a naked-exchange role and any service account that has that role can do a naked exchange. When you start allowing token exchanges, there’s various things you have to both be aware of and careful of. The first is public clients. Public clients do not have or require a client credential in order to perform an exchange. Anybody that has a valid token will be able to impersonate the public client and perform the exchanges that public client is allowed to perform. If there are any untrustworthy clients that are managed by your realm, public clients may open up vulnerabilities in your permission models. This is why direct naked exchanges do not allow public clients and will abort with an error if the calling client is public. It is possible to exchange social tokens provided by Facebook, Google, etc. for a realm token. Be careful and vigilante on what the exchange token is allowed to do as its not hard to create fake accounts on these social websites. Use default roles, groups, and identity provider mappers to control what attributes and roles are assigned to the external social user. Direct naked exchanges are quite dangerous. You are putting a lot of trust in the calling client that it will never leak out its client credentials. If those credentials are leaked, then the thief can impersonate anybody in your system. This is in direct contrast to confidential clients that have existing tokens. You have two factors of authentication, the access token and the client credentials, and you’re only dealing with one user. So use direct naked exchanges sparingly.